I think of myself as a writer of prose rather than a novelist, critic, or storyteller, and I am principally interested in the problems of style. My fictions are, by and large, experimental constructions; that is, I try to make things out of words the way a sculptor might make a statue out of stone. 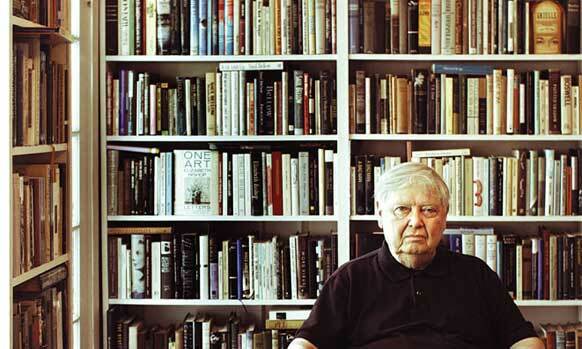 One of my favorite writers, William H. Gass, died last week at age 93. Since discovering his work a few years ago, I'd actually found it surprising that he was still alive. A figure such as he, tirelessly devoted to the primacy of the aesthetic experience of literature, seemed entirely incongruent living within our current times besotted with screen-addiction and momentary attention spans. Should we put these feelings for the object and its vicissitudes down to simple sentimental nostalgia? to our commonly assumed resistance to change? I think not; but even as a stimulus for reminiscence, a treasured book is more important than a dance card, or the photo that freezes you in mid-teeter at the edge of the Grand Canyon, because such a book can be a significant event in the history of your reading, and your reading (provided you are Significant) should be an essential segment of your character and your life. Unlike the love we've made or meals we've eaten, books congregate to form a record around us of what they've fed our stomachs or our brains. These are not a hunter's trophies but the living animals themselves. It was my friend Charlie, a fellow book fiend whose knowledge bank is substantial with 20th century scribes, who pointed me towards William Gass. A few years ago I had asked him to recommend some modern authors who specialize in exquisite prose style. He'd already led me to Pynchon's novels and now he recommended the likes of William Gaddis and William Gass. I soon read Gaddis' A Frolic of His Own and sought out Gass, zipping through his short story collection and the monograph On Being Blue with mixed feelings about both. Once I found my way into the Temple of Texts, though, there was no escaping. I picked up another essay collection, Finding a Form, and marveled at pieces like "The Book as Container of Consciousness" and "The Vicissitudes of the Avant-Garde" and then slowly devoured Life Sentences whose most striking piece was a lengthy, sober meditation on the unfathomable, sublime quantity of people slaughtered by the Nazi regime. Since learning of his passing, I've summoned copies of the other essay collections produced by Mr. Gass from all corners of the globe to converge in my library. The recommendation from Charlie came on the strength of the novel The Tunnel, Gass's masterpiece that he labored on for 30 years. I've been distantly circulating around that cinderblock-sized meganovel for a little while now, reluctant to get too close to it but intending to read it eventually. Book critic Steven Moore called it "truly one of the great books of our time" and observed, "The sheer beauty and bravura of Gass's sentences are overwhelming, breathtaking; the novel is a pharaoh's tomb of linguistic treasures." I had actually written up my thoughts about William Gass last weekend upon hearing the news of his death, only to have that piece suddenly disappear into the ether. It was a rare and infuriating experience, but I soon accepted Joyce's dictum that mistakes are portals of discovery. It dawned on me that William Gass had nearly finished composing his first novel, Omensetter's Luck, when the manuscript was stolen off his desk, forcing him to devote six months to rewriting it all from scratch. (The resulting novel was hailed by The New Republic as "the most important work of fiction by an American in this literary generation" and listed among David Foster Wallace's "direly underappreciated" novels of the latter half of the 20th century.) This kind of devotion and determination exemplifies Gass's standing as a writer's writer. He was a fiercely passionate celebrant of the artfully written word, a prolific composer of ornate prose, and his penchant for luxuriating on the love of letters has served to exponentially amplify my own enjoyment of literature. In the wake of his passing, a number of thoughtful obits have popped up. Here are links to those with some choice chunks from each as well as links to some Gass interviews. We must take our sentences seriously, which means we must understand them philosophically, and the odd thing is that the few who do, who take them with utter sober seriousness, the utter sober seriousness of right-wing parsons and political saviors, the owners of Pomeranians, are the liars who want to be believed, the novelists and poets, who know that the creatures they imagine have no other being than the sounding syllables which the reader will speak into his own weary and distracted head. There are no magic words. To say the words is magic enough. His writing reflected his knowledge of philosophy and his academic background, but it also included irreverent and often bawdy limericks. He used ordinary words to great effect, as when he described a character as having “a dab of the dizzies,” but it was his metaphors (which he said came to him in “squadrons”), his rhythms and the effort he put into each sentence that made him the object of other writers’ admiration. Sentences have souls, he explained in an essay, and if they were good enough “it would be a crime on the world’s part to let them die.” In an ideal sentence, he said, the words choose to be there. Sometimes more than 300 words chose to be in a Gass sentence, in which clauses, connected by semicolons, were strung out like railroad cars. “I have a hard time thinking there is another intellectual figure who married a deep connection with literature with a bottomless interest in philosophy … and music and photography and architecture,” said a friend, Stephen Schenkenberg, editor of the website Reading William Gass. Gass was born in Fargo, N.D., in 1924, a Depression baby whose unhappy childhood with an abusive father and alcoholic mother scarred him so deeply that he would later say he wrote to "get even." Influenced by philosopher Ludwig Wittgenstein, Gass was taken by the aesthetics of language, how a word looked and sounded as opposed to what it meant. Gass was also a great admirer of Gertrude Stein, who treated plot and grammar as contrivances rather than natural components of literature. "My stories are malevolently anti-narrative, and my essays are maliciously anti-expository," Gass once wrote. "I do not pretend to be in the possession of any secrets; I have no cause I espouse; I do not presume to reform my readers, or attempt to flatter their egos either." The charge of a writer, he maintained, was not to relate a world but to create one—a world of sound, of the rhythm and melody made when syllables collide. “No prose can pretend to greatness if its music is not also great,” he wrote. "I have always been interested in miracles — not just the one we are presently celebrating, but especially in the secular kinds," he said in his acceptance speech for the Capote award. "A miracle is something that cannot happen, and shouldn't, and won't again, but has occurred all the same, despite laws, odds, expectations. "To adorn nature with a new thing: that is the miracle that matters." William Gass was an excellent interview subject. There's a nice collection of Gass interviews collected here---The Ear's Mouth Must Move: Essential Interviews of William H. Gass. Thank you for this beautifully written tribute to the Master. William Gass has been my literary love interest for a decade now. It's difficult to recall who (or why) I read before discovering his "In the Heart of the Heart of the Country" in a used copy of the Norton Anthology of Postmodern Literature. It was love at first read.